CTV > News > Services > Life Science > PhotoThera, Inc.
PhotoThera, Inc. (formerly Acculaser, Inc.) is a medical device company focusing on the $20 billion soft tissue injury market. 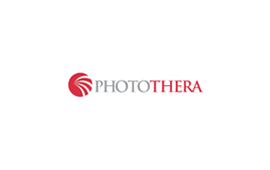 PhotoThera’s patented cold laser technology is a non-invasive treatment for the treatment of musculoskeletal injuries including tendonitis, carpal tunnel syndrome, sprains, contusions, whiplash, and many other inflammatory conditions. It increases cell metabolism, microcirculation, and clearance of noxious substances associated with the inflammatory response. The device does not heat the injury. The light energy from the infrared laser is absorbed at the cellular level and converted to chemical energy. The PhotoThera device has received FDA approval for carpal tunnel syndrome and tendonitis.